Signals group of the Duke of Wellington's West Riding Regiment circa 1900. William Godfrey Clayton is third from the left in the front row. 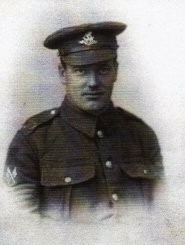 William Godfrey Clayton's service in the West Lancs Regiment began in 1903 when he was under age. He enlisted under the name of William Willows. As Sgt William Willows he was awarded the DCM in 1918.